Whoa, sorry for the absence last week. I started getting sick last Tuesday, then my birthday was Wednesday and then that night I got hit with the cold from hell that went buckwild on my immune system. 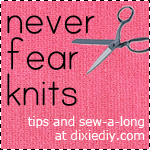 I’m feeling better now but all last week I didn’t feel like doing anything – no sewing, crafting, drafting, eating. So now I hope to hit the ground running this week. I’m working on my new shirt pattern. It’s all drafted and sized and I only have instructions, illustrations and layout left. Look out this week and next week for a few little tutorials (sewing a v-neck on a t-shirt, simple belt making, and attaching appliques to shirts), some giveaways and more sewing projects! I’ll also be recapping the first meeting of my sewing book club and talk about how you can start your own with your friends. Ok, enough of all that – back to work for Dixie!